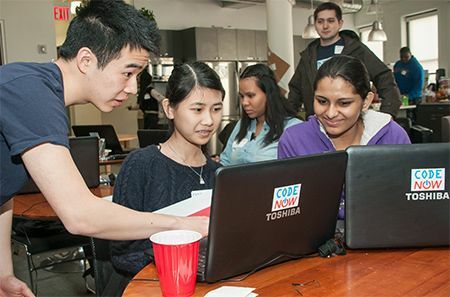 CodeNow, a nonprofit program that teaches coding basics to high schoolers, with an emphasis on reaching girls, ethnic minorities, and other underrepresented groups, is in the middle of a significant expansion. After launching in Washington, D.C., in 2011, the program has now launched in New York City and is currently holding training sessions with its first NYC group. In a few months, it’s going to select participants in its first fellowship program, which will take place over the summer. And later this year it plans to launch in San Francisco. CodeNow’s curriculum uses tools like Hackety Hack (for programming basics) and Lego MindStorms (for robotics). It involves a combination of weekend sessions and online coursework, as well as a boot camp (held over the longer school breaks or on consecutive weekends) with “intensive training” in Ruby. Even though the program started (and will continue) in D.C., Seashore has moved to New York, and it sounds like he can be more ambitious with the NYC program, admitting more students, holding more classes, and launching the fellowship program. “There was a real need and desire for a program in D.C. — the financial support was just harder to come by,” Seashore said. When launching in NYC, Seashore said CodeNow received more than 250 applications, from which the team selected 13 girls and 12 boys. Seashore said CodeNow accepts applicants from all five boroughs of New York, and it provides subway cards to help the kids get to the training sessions in downtown Manhattan. Interested NYC students can apply here. The deadline is Wednesday, April 17. Adults, meanwhile, can sign up to volunteer.